Two tiny, half a dozen very tiny/minute rim chips, minor surface marks. 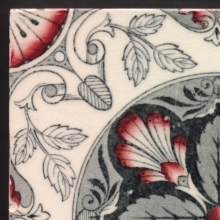 A four corner repeat stylised floral design, another that is at least somewhat rare for it bears a registration number which I do not have in my collection. Made by Smith, Ford & Jones a fairly prolific pottery company which by 1894 had become Smith & Ford later to be Samuel Ford & Co. 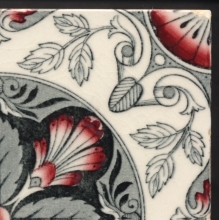 The company also produced a reasonable range of tiles, pattern numbers as high as 274 have been recorded. 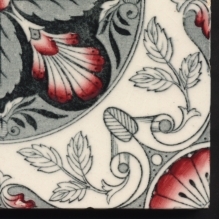 All are transfer prints, often coloured and well coloured to the standard of a pottery maker rather than a tilemaker - pottery is seen in the hand or on the plate in front of you rather than on the wall or fireplace a few feet away. This is somewhat less good than I associate with SF&J, the design I think not so great, the execution with just one painted colour that has not taken too well, the biscuit is even just over 1/8" (4mm) undersize. 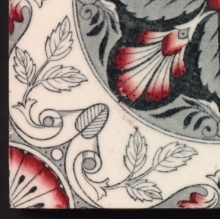 So perhaps more an interesting tile for collectors more than to adorn a wall or splashback again. Verso very clean, printed S.F.&J., registration number and pattern number.